A positive review from the lovely folk at makeusof.com. Nice to be noticed! Apple has also included us in some of their featured lists around the world, which as any developer knows is about as good as it gets. Small update and new features coming. The plant height setting has been the cause of some frustration for many users, so we fixed it by utilizing simple text-entry boxes. This applies to both iPad and iPhone users. We’re also getting close to releasing a big update for those of you who like to keep notes and be reminded about things in your garden. We’ve received a lot of requests for these features so stay tuned! 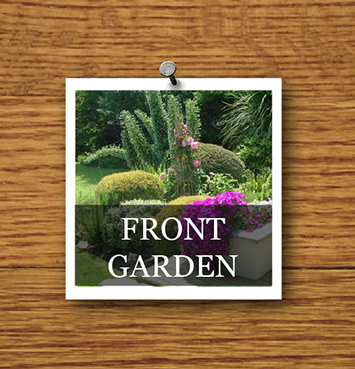 New version (2.2.2) with custom garden plaques. For all of you who asked for more gardens, you’ll be pleased to know that the new update features 12! Simply flick left and right on the my gardens section to view all the gardens. You can of course rename them however you want. Another month, another update to the Gardening Toolkit. Once again we’ve been focussing on the harder programming aspects. The new custom search feature is something that users have been asking for a while now and should be handy, although it did require a lot of care to ensure the app didn’t blow out to a massive size. Plant thumbnail images is hopefully a useful and visually appealing addition for the search view. There’s a few other bits and pieces in there too, such as the ability to now sort your gardens by name or date. As always, let us know what additions to the app you’d like and we’ll see what we can do. Enjoy the update! 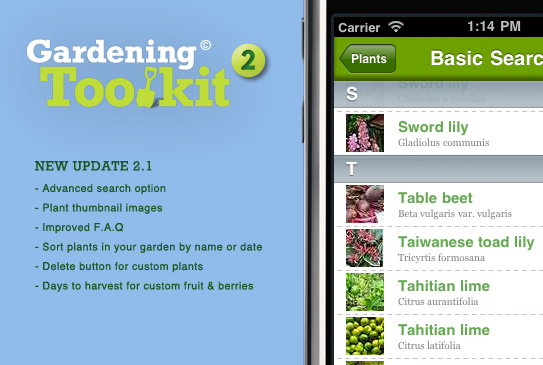 The Gardening Toolkit Blog · All the news on the must-have app for gardeners.